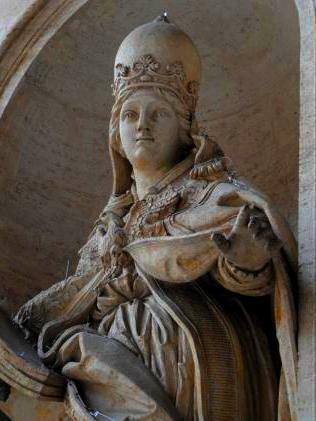 Sadly, pope Joan – lovely idea though she is – is entirely fictional. According to legend, after the death of Pope Leo IV in 855 (some sources say after Pope Victor III in 1087) a pope was elected, who took the title John Anglicus. His reign was to be so short, however, as during an Easter procession between St Peter’s and the Lateran palace an excitable crowd pushed him from his horse. The shock of the fall brought on premature labour and “John” promptly gave birth to a baby. John was in fact Joan. 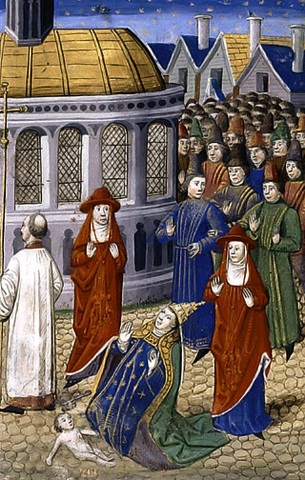 The crowd then dragged her through the streets of Rome, tied her to a horse before stoning her to death – thus making their opinion of female popes abundantly clear. However there are no contemporary accounts of any of this and no room in the chronology of popes to fit in her supposed reign of over two years. In fact, the earliest account appears in the Universal Chronicle of Metz, written around 1250, some 400 years after Pope Leo IV’s death. It may have originated as a satire on the papacy put around by the court of the Holy Roman Emperor Frederick II, who had annoyed a lot of 13th century popes by sidestrepping their attempts to make him go on crusade. The papacy had, in turn, excommunicated Frederick, and he responded by telling stories about how worldly and unholy the papacy was. And what better story than that the pope had once – horrors of horrors – been a woman. It was the perfect conspiracy theory and proved an enduring legend – and wasn’t disapproved until the 17th century.